Get your gear before it's gone! This weekend, talk to Quibble Coinbiter in Battleon this weekend to see all of his new Frostval 2017 rare items, available in his shop and Frostval Collection Chest. 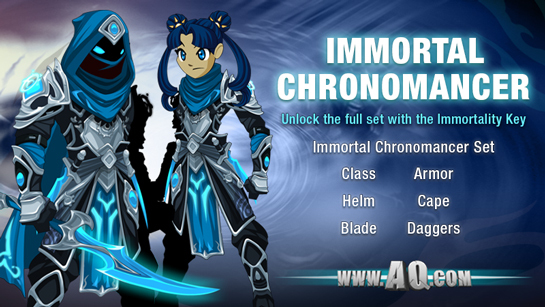 Plus, unlock the Immortal Chronomancer Class and armor set when you buy the Immortality Key from Vinara in Battleon town. 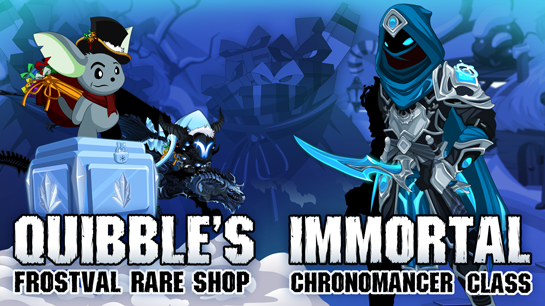 And if you have Quibble's Frostval Collection Chest, you'll find his new gear in your shop automatically this Friday. This Friday, unlock the Immortal Chronomancer Class and armor set when you buy the Immortality Key from Vinara in Battleon town*. This is the in-game variant of the Eternal Chronomancer Class, which is unlocked when you get the 2018 Artix Entertainment Calendar from HeroMart. 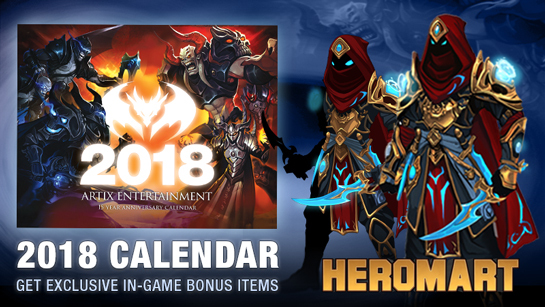 If you purchased the 2018 Calendar from HeroMart, when you log in this weekend, you'll find the Immortal Chronomancer set in your calendar badge shop. Historically, in-game Calendar Classes were only available when you bought a physical calendar from HeroMart. Last year was the first year we released an in-game variant, due to issues with rising shipping prices and payment provider availability (example: Paypal was no longer accepted in certain countries). Over the last year, Stryche from HeroMart has worked tirelessly to reduce the cost of international shipping costs, and we are in the process of getting additional payment methods for countries that are currently locked out. Because of those improvements, this is the last year we will feature an in-game calendar class variant. Next year, we'll go back to having the Calendar Classes as HeroMart-exclusive rewards, as the calendar classes were originally intended to be. * The 2017 Timelock Key and ShadowStalker of Time gear has been moved from Chronix to Vinara, as well.